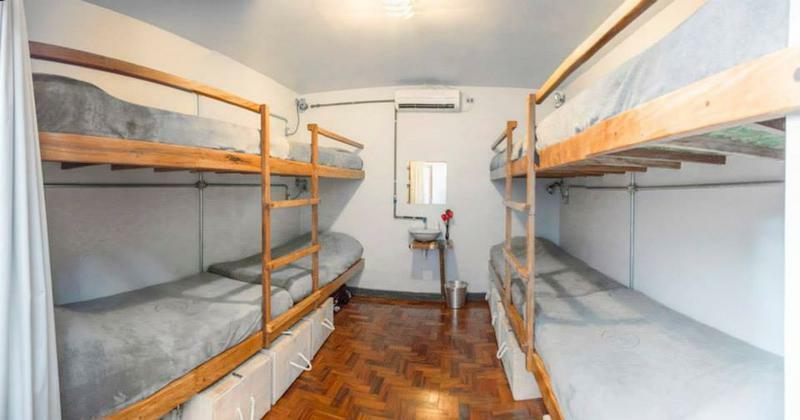 CityLights Hostel is located in the Pinheiros district, one of the best neighborhoods of Sao Paulo. Situated two blocks from the Faria Lima metro station and near several bus stops, it is easily accessable from almost anywhere in the city. Within just a block or two from the hostel are many great restaurants, bars, pharmacies, a supermarket, and a countless shops and stores. The hostel itself is a calm and relaxing place, with lush greenery and open architecture creating an inviting atmosphere for guests. Our focus is on comfort, privacy, sustainability, and promoting the interaction of guests with one another. The managers and staff are always working to maintain a vibrant atmosphere at the hostel with events including dinner parties, festivals, and cultural and sporting events. We also organize unforgettable multi-day trips to many of the specacular beaches between Sao Paulo and Rio de Janeiro. We have dorm-style rooms varieing from 4 to 11 beds, an all girls ensuite dorm room, and two private rooms with queen beds and contemporary bathrooms. All standard rooms have a sink. Each bed has an individual power socket, reading light, and locker. Located on a quiet street off of Av. Faria Lima. We sit just blocks from the galleries and boutiques of Vila Madalena, and the countless restaurants of Pinheiros. With Faria Lima Metro only 600m away, you can be at Paulista or Liberdade in less than a half hour. If you love to cook, head to the nearby market and prepare yourself a meal in our fully equipped professional kitchen. From remote waterfalls to hidden fishing villages, CityLights Alternative Trips let's you visit inaccessible locations, and gives you the freedom to soak in the local culture. When it's time to leave Sao Paulo, let us show you our favorite out-of-the way spots. Theres three options for traveling from GRU to Citylights. If youre on a budget, and dont have too much luggage, you can brave the bus and metro (R$6 /person) If youre alone, but arent sure about the public bus, you can take a shuttle service and then the metro (R$38 /person). If youre with friends, or just want the safest and easiest option, well pick meet you outside customs and drive you to the hostel for R$120 (up to 4 people). You can also always catch a taxi at the airport - its R$130. Catch local Bus 257 to Metro Tatuape. It stops at the island outside Terminal 1. Pay the conductor near the turnstile after boarding (R$3). Get off at Tatuape station. Buy a single metro ticket from the Billeteria (R$3), and take Line 3 (Red) towards Palmeiras-Barra Funda. Get off at Republica and transfer to Line 4 (Yellow) headed towards Butant. Get off at Faria Lima station, and look for a pink and black striped skyscraper (Instituto Tomie Ohtake) in the distance. Walk down Av. Faria Lima towards it for about 600 meters and turn right on Rua Padre Garcia Velho. Were a block and half up the street on the left-hand. Walk out of the terminal 2, turn right, and walk past the shuttle buses to the ticket office labelled Airport Bus Service. Buy for a ticket to Republica (R$35, cash or credit card). Buses depart every 30-45 minutes and the departure time is on your ticket. When you arrive at Republica Square, go to the metro station, buy a single ticket at the Billeteria (R$3), and take Line 4 (Yellow) towards Butant. Get off at Faria Lima station, and look for a pink and black striped skyscraper (Instituto Tomie Ohtake) in the distance. Walk down Av. Faria Lima towards it for about 600 meters and turn right on Rua Padre Garcia Velho. Were a block and half up the street on the left-hand. Call or Email us in advance. Well be waiting with beers outside customs. Outside Terminals 1 and 2, are taxi ticket booths labelled Guaracoop. Show them the address, and theyll arrange a taxi for the fixed price of R$130.32. You can pay with in cash ($, , $R), or with a credit card. If youre by yourself, and dont have too much to carry, a local bus goes directly from Congonhas to the hostel. If youve got a lot of luggage, or arent so fond of local buses in developing countries, you can always take a taxi. Catch local bus 576M-10 toward Pinheiros. Pay the conductor near the turnstile after boarding (R$3). Get off at the last stop, and walking up Av. Faria Lima towards the pink and black striped skyscraper. After 400 meters, turn right on Rua Padre Garcia Velho. Were a block and half up the street on the left-hand. Theres plenty of taxis outside the airport. Theyre all safe and will use the meter. Itll be about $R30 depending on traffic. towards Jabaquara. Get off at Luz and transfer to Line 4 (Yellow) headed towards Butant. Get off at Faria Lima station, and look for a pink and black striped skyscraper (Instituto Tomie Ohtake) in the distance. Walk down Av. Faria Lima towards it for about 600 meters and turn right on Rua Padre Garcia Velho. Were a block and half up the street on the left-hand. Find the metro within the bus station, and buy a single metro ticket from the Billeteria (R$3). Take Line 3 (Red) towards Corinthians - Itiquera. Get off at Luz and transfer to Line 4 (Yellow) headed towards Butant. Get off at Faria Lima station, and look for a pink and black striped skyscraper (Instituto Tomie Ohtake) in the distance. Walk down Av. Faria Lima towards it for about 600 meters and turn right on Rua Padre Garcia Velho. Were a block and half up the street on the left-hand.